This blog isn’t about me at all. It’s about art and kids. Especially the kids in the 4th grade room at a public elementary school in Long Beach CA in a school district with 50 elementary schools serving aprox. 50,000 students which doesn’t have a single paid art specialist or a dedicated art room in any of it’s 50 schools. I’m just saying………. **As of December 2008 we are no longer in a public school classroom. We are moving our classroom to the community room of the local library. For details see this post. In the writing of this blog I often refer to “we”. “We” are 2 moms from the neighborhood whose kids attended this elementary school 12 &13 years ago. Our kids are now in HS and college. They moved on, we stayed. 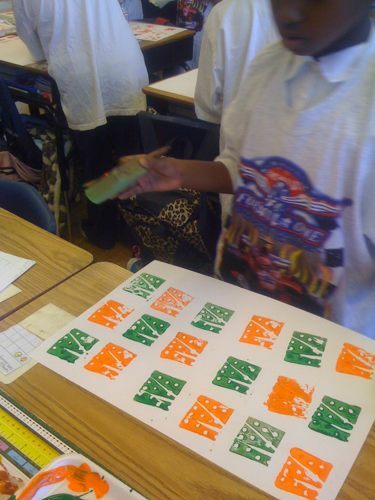 When our kids were in elementary school we volunteered and taught art in our kids classes on a weekly basis. Neither one of us wanted to see our kids go through school without art. When our kids moved on so did we. For a while. We missed kids and art and returned to teach on Mondays with the support of teachers who also wanted art in their room but couldn’t do it themselves. It’s free- we volunteer our time, but supplies do cost us money- and to that end we have added a paypal donation link to the sidebar for parents (and anyone else in the universe) who wants to donate toward the supplies we buy. Every little bit helps and we thank you. Who are we in our “real” lives? A full time artist and a laboratory scientist. Art and science. Go figure! If you want to see what California schools are supposed to be teaching in the area of visual arts, go here. If you want to volunteer in the public schools in LBUSD go here. I am an elementary(3rd-5th) art teacher in Georgia. I am very fortunate to work for a principal who believes in the arts. I am planning my 3rd annual Art Day and wondered if you have any ideas for projects. This lasts the whole day and we try to come up with one thing that every child(about 150) in a grade can participate in creating. This is usually something that is a permanent fixture at the school. We have done murals the past two years and are looking at something for outside this year. Any suggestions? About 10 years ago we did a ceramic tile project that we later installed on the outside of the school building in the kindergarten playground. It was actually a fundraiser held at the annual school carnival and each child paid $3 to participate. We provided all the materials (4×4 bisque tile and ceramic underglazes) The kids painted a design on the tile and I glazed and fired them. I mention this as you stated you wanted something everyone could do and something for outside. It’s a pretty ambitious project though. You need to have some ceramics knowledge and then there is the installation process. We actually chiseled out the stucco wall so we could flush mount the tiles. It took us about a month of weekends and evenings to get them all set and grouted (about 500 tiles). It is still there today and in excellent condition. I recently noticed another tile project that was done some years later in the “Secret Garden” that is in terrible condition due to incorrect installation techniques and poor choice of materials- you do have to know what you’re doing on a project like this and have the manpower to follow through to completion. I’ve been meaning to photograph that project anyway- I’ll post a pic soon. Please consider adding a link to our magazine as a resource on your blog. Launch Pad publishes fiction, nonfiction, poetry, and artwork by children ages 6-12. The magazine is an open access resource, and we do not charge parents, teachers, or children any sort of publication or submission fees. The first two issues are now published. We are still looking for submissions for our upcoming ocean and summer fun (hiking, camping, summer sports, vacations, etc.) issues. Please feel free to share this resource with any of your students or other aspiring young authors or artists!